Villa Azzurra is an exclusive stunning first line Las Brisas Golf course . 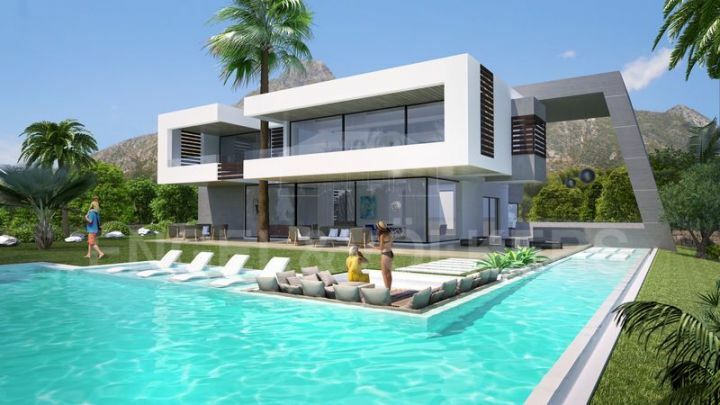 Property located in the heart of Nueva Andalucía Marbella, with a central location in the golf valley of Las Brisas Golf: 4500 m2 of land boarding the golf course. It is divided in 3 plots all with spectacular views on the golf course, 1000 m2 build with the most luxurious finishes, a guest house of 188 m2. The 3rd plot has a license and legal permission to build a new house of around 350m2 + basement & terraces. The entire property has just been renovated and redesigned by French Designers. . There is 24 hours security and the house belongs to a gated community. 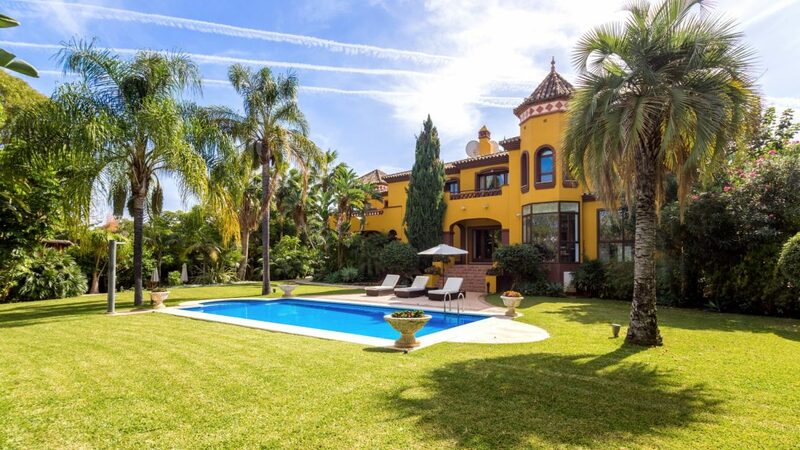 Villa Azzurra is a place of peace and tranquillity just 5 minutes away from the glamourous Puerto Banus. In the gardens you can find more than 100 palm trees and exotic plants. There are Italian renaissance marble fountains making this place incredibly exclusive. Main House: Ground floor: At the entrance of the house, there is a beautiful neo-classical marble sculpture welcoming the visitor. The entrance hall is large with access to the first floor, to the living Room and to the bedroom corridors. The Living room is large, very comfortable and very bright, about 100 m2. A 17th century hand rail has been installed in the stair case going down to basement living room. From the living room you can access a large terrace with amazing view on the pool area and on the Golf course. There is a Renaissance marble fire place of 2×2 m2, spectacular, and comfortable. The ground floor has 5 bedrooms in suite with their private dressing room and their individual bathroom, a large kitchen with an access to the dinning/living room. 1st floor: On the top floor is located the Master bedroom with private office, private dressing room and private bathroom. (There is also a room to make an extra bathroom if wanted.) The bedroom has a wide terrace with panoramic view over the Golf course and on the pool and the park. There is also a fireplace. Basement: From the living room you are accessing the basement. The living room of the basement is very wide and can be used as a private discotheque or a game room. There is also a good sized room that can be used for home cinema. You have 4 bedrooms for the service employees or for other uses. Guest House: The house is 188m2 and 500m2 of plot. 4 bedrooms (3 king size beds and 1 double bed room), 3 bathrooms, a large living room, a brand-new kitchen, guest toilet, laundry, air conditioning, terraces and small garden with pool , in the urb. 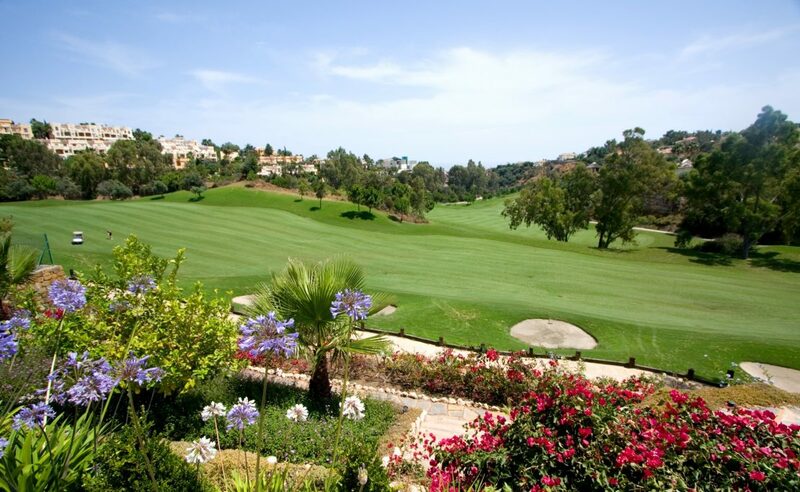 Parcelas del Golf Nueva Andalucia, 24h security, 5 mins from Puerto Banus. Please, send me more information about ref W-01ZZZ0, Villa in Nueva Andalucia or similar properties.